I just recently got a kitchen/dining room table. This might not seem like a big deal but when you consider we have lived for almost a year without a table, it’s kind of a big deal. Wait that’s not quite the truth, we did have a table, it just wasn’t the kind you could/should eat from. We had a massage table. In our dining area. Yep – true story. Let me back up – last year when we decided to join the minimalist movement and reside on the West Coast of Canada, we had 20 years’ worth of possessions to get rid of in our 1200 square foot bungalow, double garage and shed full of our life, as it were. We picked up each and every item and asked ourselves if we loved it and if we needed it – like really loved it or needed it. To most of the items the answer was no, so we left most everything behind and started our journey with just a pickup truck and small trailer full of our belongings to cart out west. Upon our arrival we bought a bed, a couch and a massage table (since The Hub quit his job to make the move we no longer had extended health benefits – so monthly massages wouldn’t be in the budget anymore unless we did them ourselves!). That was pretty much all we had for almost a year. We were committed to buying what we loved, not just what we needed or what matched or what was on sale. And so, we managed just fine thank you. We didn’t have many friends to invite over yet so it really didn’t matter if there was somewhere for them to sit, lol. We enjoyed eating on the couch after a lifetime of eating at the table with the kids, it felt like a treat! Anyway, we finally found a table we love. 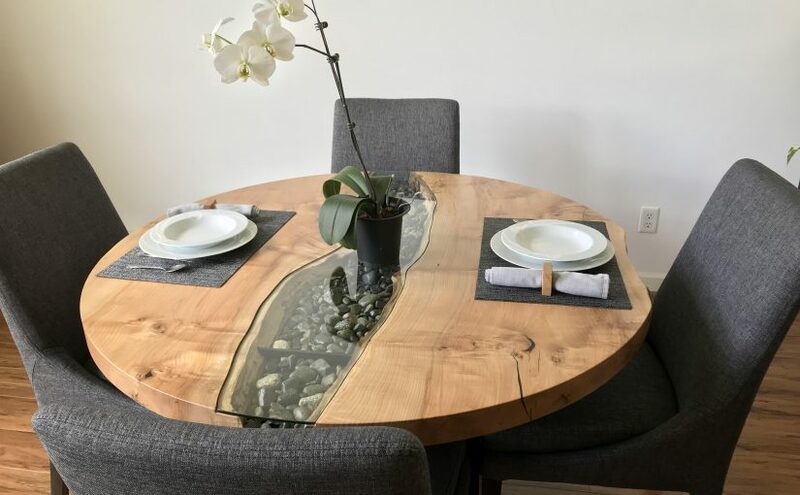 It’s called live edge furniture and it’s made from a tree grown right here on the island, we think it’s gorgeous and we eat every meal from that table now. Suddenly, we started finding other things we loved and our place began looking like a real home. A home where we can live and play amongst a few possessions we love and that help us feel happy. 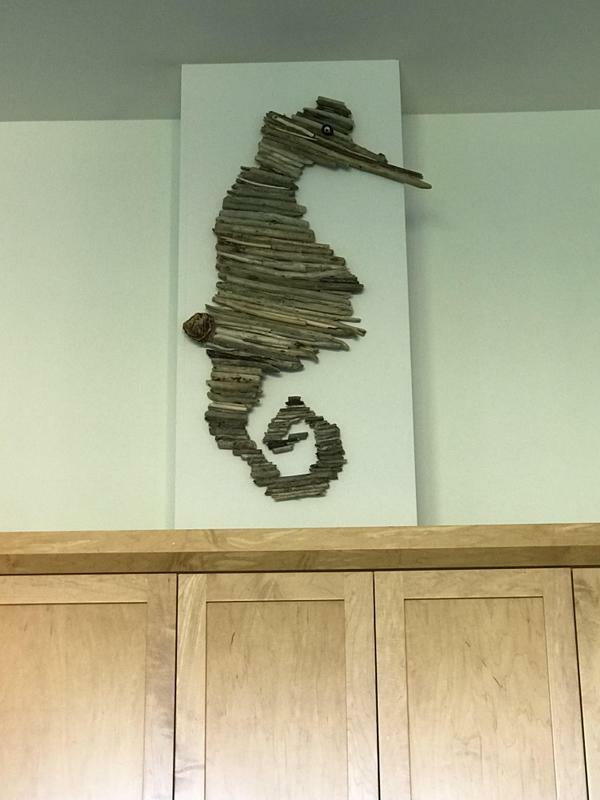 Except for the awesome driftwood seahorse we made, the walls are still pretty empty but that will come. No rush. Who is this crafty girl that isn’t in a rush? It can’t be me, can it? Surprise, surprise, surprise. Whether it’s a relationship or a project or something altogether different, sometimes putting on your patience cap is worth the effort. Sometimes it’s better to wait to get what you want or need than rushing into something that’s good enough or even not quite right. Not always, but sometimes. You have to surround yourself either way. Consider taking a good look at what (and who) you are surrounding yourself with. Are they things you think you should have, things that others gave you, things that you used to love but don’t anymore? What if you got rid of them and make space for new and beautiful things that you love now, things that bring you joy each time you look at them or use them. Consider surrounding yourself with people you love and that bring you joy, too. People who share in your delights and accomplishments, people who make you feel good about yourself, people who appreciate you just as you are. Yes, our life was technically empty for awhile but we actually enjoyed that space. Even more we enjoyed how at the right time it filled up with the right things and the right people and in this case, I would rather wait for right than rush. Today I ask you what’s the rush? What’s your rush? Have you been rushing into something lately? Is someone else rushing you into something you are not quite ready for? And, then if you are so inclined, look around at what you are surrounding yourself with both literally and figuratively and see if/where a shift needs to happen. Two more ways to live Your Life, Unlimited! P.S. Here is a photo of Jerome, our driftwood seahorse! This entry was posted in Empowerment, Newsletters, Personal Growth, Success principles, Wellness and tagged e-news, empowerment, happiness, personal growth, Stephanie Staples, Your Life Unlimited. Bookmark the permalink. Previous Previous post: Leave your Legacy!